This study seeks to understand the evolution of digital game industry and the interaction between different parts of the digital game ecosystem. Within this scope games published since 1980’s by the Activision game publishing company were analyzed. In this framework the main questions that the study attempts to answer are: What kind of a development path has the global gaming industry followed? What is the relation between the digital games and game consoles? How digital games and other sectors in the culture industry interact? What kind of a life cycle models exist in the digital game ecosystem? Which dynamics and strategies are applied during the introduction of new digital games on the market? For founding answer to these questions, the publication dates and digital game series of Activision games, game console generations and cinema - television contents which are related to Activision’s games were analyzed with the quantitative content analysis methodology. According to the results we can conclude that an artificial life cycle of digital games are created by reproducing and publishing game series into the market. This result reveals that games are produced in a complex game ecosystem where; game publishers, diverse sectors of the culture industry, and console producers interact and cooperating between each other to formulate a repetitive artificial live cycle model. Bu çalışmanın amacı küresel dijital oyun endüstrisinin gelişim sürecini anlamak ve dijital oyun ekosisteminin bileşenleri arasındaki etkileşimi çözümlemektir. Bu kapsamda dünyanın en büyük oyun firmaları arasından yer alan Activision firmasının 1980 yılından itibaren piyasaya sürdüğü dijital oyunlar incelenmiştir. Çalışmanın odaklandığı sorular şunlardır: Küresel oyun endüstrisi nasıl bir gelişim patikası izlemiştir? Dijital oyunlar ve oyun konsolları arasında ne tür bir ilişki bulunmaktadır? Geliştirilen oyunlar ile kültür endüstrisindeki diğer sektörler arasında nasıl bir etkileşim bulunmaktadır? Bu bileşenler nasıl bir yaşam döngüsüne sahiptir? Hangi dinamikler ve stratejiler gözetilerek yeni oyunlar piyasaya sürülmektedir? Bu sorulara yanıt bulmak amacıyla çalışma Activision firmasının geliştirdiği oyunların yayımlanma tarihleri, geliştirilen oyun serileri, oyun konsollarının nesilleri ve dijital oyunların ilişkili olduğu sinema ve televizyon öyküleri niceliksel içerik analiz yöntemiyle çözümlenmiştir. 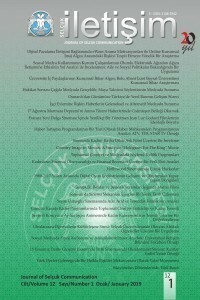 Elde edilen sonuçlar doğrultusunda dijital oyunların yapay yaşam döngülerinin oluşturulduğu ve bu oyunların düzenli aralıklarla yeniden üretilerek piyasaya sürüldüğü belirlenmiştir. Bunun sonucunda dijital oyunların; oyun yayımcıları, kültür endüstrisindeki farklı sektörler ve konsol üreticilerinin dahil olduğu üç ayaklı karmaşık bir dijital oyun ekosistemi içerisinde geliştirildiği ortaya konmuştur. Adoni H. ve H. Nossek (2001) The New Media Consumers: Media Convergence and the Displacement Effect, Communications, 26(1), 59–83. Aris, A. ve Bughin, J. (2009) Managing Media Companies: harnessing creative value, Wiley, Chichester. Arrese, A. (2006) Issues in Media Product Management, A. Albarran, S.M. Chan-Olmsted and M.O. Wirth (der.) Handbook of Media Management and Economics. Mahwah, 180-201. Bolter, D. ve Grusin, R. (1999) Remediation Understanding New Media, MIT Press, ABD. Cao, H ve folan, P (2012) Product life cycle: the evolution of a paradigm and literature review from 1950–2009, Production Planning & Control, 23(8), 641-662. Clairfield Internatioanl (2018) Gaming Industry – Facts, Figures and Trends. http://www.clairfield.com/wp-content/uploads/2017/02/Gaming-Industry-and-Market-Report-2018.01-2.pdf, Erişim Tarihi: 12.07.2018. Dhalla, N.K. ve Yuspeh, S. (1976) Forget the product life cycle concept! Harvard Business Review, 54(1), 102–112. Dogruel, L. (2013) Opening the Black Box. The Conceptualising of Media Innovation, Tanja S. ve Arne H. K. (der. ), Media Innovations: A Multidisciplinary Study of Change, Nordicom University of Gothenburg, İsveç. ESA (2017) Essential facts about the computer and video game industry. http://www.theesa.com/wp-content/uploads/2017/04/EF2017_FinalDigital.pdf, Erişim Tarihi: 11.07.2018.European Commission (2017) Report from the commission to the council and the european parliament, Brüksel. Grusin, R. (2016) DVDs, Video Games, and the Cinema of Interaction Post-Cinema: Theorizing 21st-Century Film, Denson, S ve Leyda, J. (Der.). Reframe Books. Hamouti, R. (2016) Create alone or in cooperation: What is the best strategy for the performance of radical product innovation in the video game industry?, ISPIM Innovation Summit, 4-7 Aralık 2016, Kuala Lumpur, Malaysia. Jenkins, H. (2006) Convergence Culture, New York University Press, NewYork. Katz, E. (2009) The End of Television?, ANNALS, 625, 6-18. Lehman-Wilzig, S. ve Cohen-Avigdor, N. (2004) The natural life cycle of new media evolution: Inter-media struggle for survival in the Internet age, New Media & Society, 6, 707–730. Manovich, Lev (2016) “What is Digital Cinema” Post-Cinema: Theorizing 21st-Century Film Der. Shane Denson and Julia Leyda. Reframe Books. Napoli, P.M. (1998) Evolutionary Theories of Media Institutions and Their Responses to New Technologies, Lederman, L. (der.) Communication theory: a reader, Duduque, Kendal/Hunt, 315-329. Nielsen, J. (1998) ‘The End of Legacy Media (Newspapers, Magazines, Books, TV Networks), http://www.useit.com/alertbox/980823.html Erişim Tarihi: 5.07.2018. Rink, D.R., vd. (1999). Financial management and planning with the product life cycle concept. Business Horizons, 42(5), 65–72. Saffo P. (1992) Paul Saffo and the 30-year Rule, Design World, 24, 18–23. Savin, S. ve Terwiesch, C. (2005) Optimal product launch times in a duopoly: balancing life-cycle revenues with product cost. Operations Research, 53(1), 26–47. Scolari, CA. (2013) Media evolution: emergence, dominance, survival, and extinction in the media ecology, International Journal of Communication 7, 1418–1441. Statista (2018) Average daily time spent playing games per capita in the United States in 2017, by age group (in minutes), https://www.statista.com/statistics/789835/average-daily-time-playing-games-us-by-age/, Erişim Tarihi: 11.07.2018. Statista (2018) Film and Movie Industry - Statistics & Facts. https://www.statista.com/topics/964/film/ Erişim Tarihi: 11.07.2018. Stöber, R. (2004) What Media Evolution Is, European Journal of Communication, 19(4), 483–505. Turner, G. (2005) Ending the affair. University of New South Wales Press, Sydney.Westerman, G., McFarlan, F.W. ve Iansiti, M. (2006) Organization Design and Effectiveness over the Innovation Life Cycle, Organization Science, 17(2), 230-238. Wijman, T. (2018) Mobile Revenues Account for More Than 50% of the Global Games Market as It Reaches $137.9 Billion in 2018 https://newzoo.com/insights/articles/global-games-market-reaches-137-9-billion-in-2018-mobile-games-take-half/, Erişim Tarihi: 12.07.2018.